On 11/30/14 at 2:22 A.M., Columbia Police Department officers were dispatched to the 1400 block of Illinois Avenue in reference to shots fired. Officers arrived on scene and located two gunshot victims. Officers administered aid to the victims and they were transported by ambulance to a local hospital. One of victims, Rickie Dunn, age 40, from Columbia, was pronounced dead at the hospital due to his injuries. The second victim, age 18 was treated for his injuries. This incident has been ruled a homicide and police are asking for your help! If you have any information regarding this incident, or if you know anyone with information, please urge them to call 875-TIPS to remain anonymous. 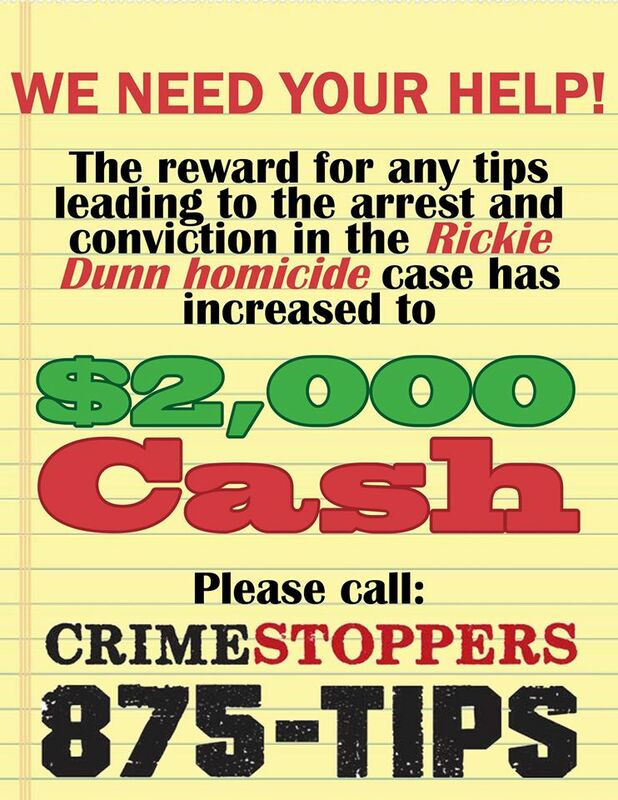 The Columbia/Boone County CrimeStoppers Board of Directors has agreed to increase the reward to $2,000 cash for tips leading to an arrest and conviction in the homicide of Rickie Dunn. The decision for the increased reward was made on April 2, 2015 at the CrimeStoppers monthly Board of Directors Meeting after the Columbia Police Department asked CrimeStoppers for their assistance. Rickie Dunn, 40, was shot in the 1400 block of Illinois Avenue in November, and was pronounced deceased at the hospital due to his injuries. Tipsters have been reluctant in providing information about the incident. 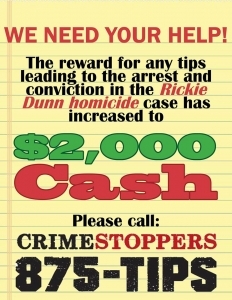 CrimeStoppers and CPD hope that the increased reward amount will provide more incentive for details and tips from those who may have information and have yet to come forward. If you or anyone you know had any information regarding this incident, please contact CrimeStoppers at (573) 875-TIPS.